Create Ice Creams with the new Ice Cream Maker. New hairstyles and apparel perfect for any chef-to-be. Modern looking cabinets and counters for your kitchen. Mix Things Up in the Kitchen! All the new kitchen stuff is perfect for your foodie Sims. 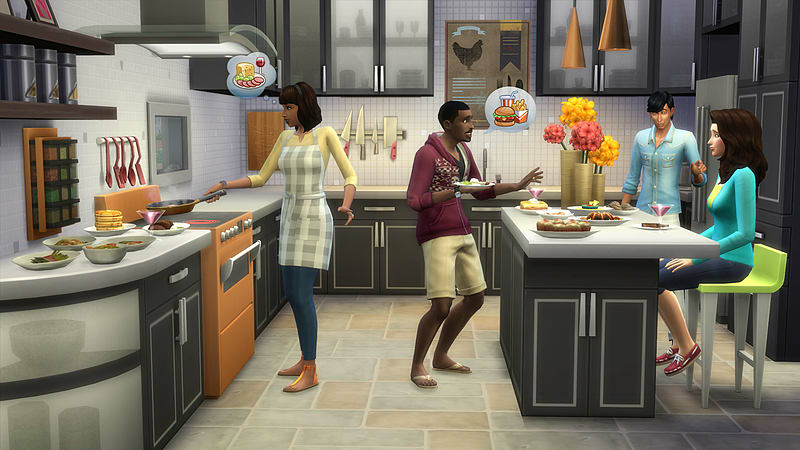 Get a lot of cool stuff with The Sims 4 Cool Kitchen Stuff Pack. Try the new Ice Cream Maker, new stylish cabinets in a modern design and what do you think about the new clothing and hairstyles? Place new sleek stainless steel appliances or try the new cabinets with frosted glass doors. There are new food related paintings to decorate your kitchen with and also beautiful new flowers to place on the kitchen counters.